3 Denmark Street, the new home for the Olivier Cornet Gallery, is steeped in Irish history. Its four walls were the home of the notorious John Toler, former Chief Justice of Ireland nicknamed ‘The Hanging Judge’; subsequently in a post-Emergency Ireland it served as a boy’s technical school – with the main gallery space being a gymnasium. This rich tapestry of Irish history provides a fitting backdrop to Eoin Mac Lochlainn’s latest body of work entitled Diaspora. As the name suggests Mac Lochlainn’s series tackles the emigration Ireland has suffered in recent times but approaches the subject from a more internal viewpoint than previous looks at this topic. 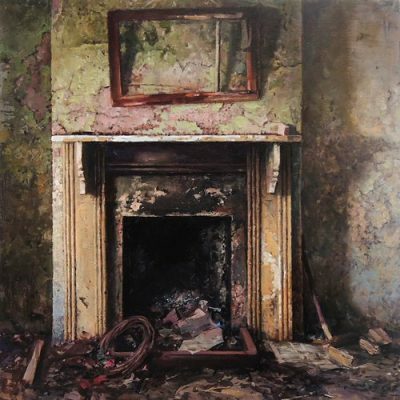 When you enter the space you are greeted by an almost full height painting of a decaying fireplace and its surroundings walls. Diaspora is made of of two contrasting series that are interwoven to complement and augment each other. One is a series of fireplaces in abandoned homes, the other a series of pastel skies. The fireplace has a rich tradition in Ireland with families taking a lighting sod from one hearth and transferring it to another when moving home to continue the chain. These works document this lineage broken by the migration to more urban areas be they Irish or abroad. The pastel skies which interlace these portraits seek to offer a viewpoint into a more hopeful future. The fireplaces that Mac Lochlainn documents are constructed from a diverse set of materials and using a variety of styles from simple stone arrangements to more ornate mantles – highlighting the trend across all social backgrounds. The varying levels of decay highlight this trend as something that is a long-term and on-going process rather than something limited to the post Celtic Tiger era. The Irish language is heavily injected throughout the show with Irish titles and Gaelic poet Cathal Ó Searcaigh’s poem Na Bailte Bánaithe featured as well. You get the feeling that, while this collection of work is strong, that this is a series that overall Eoin hasn’t finished with. Until then be sure to check out this chapter in it’s development. The show runs until October 11th and Eoin features on TG4′s Imeall on October 1st.